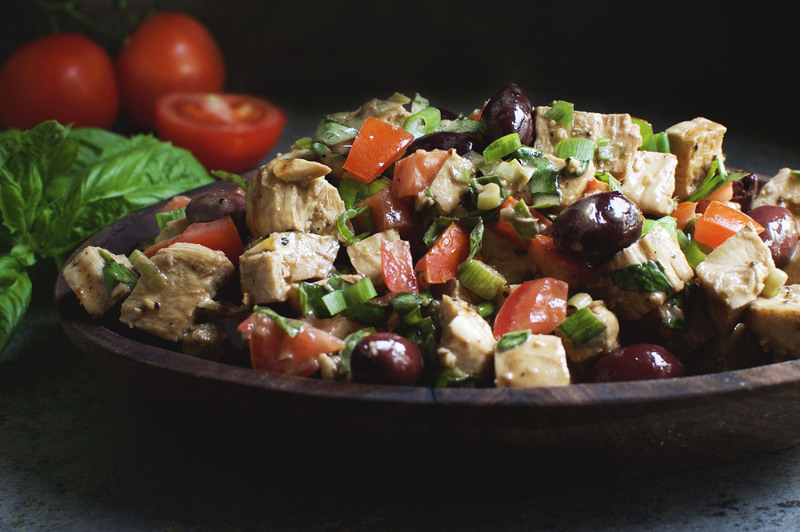 This Basil Balsamic Chicken Salad recipe features a Mediterranean twist. This delicious salad can work for those people on low-carb, ketogenic, LC/HF, diabetic, gluten-free, grain-free, Paleo, or Banting diets. I confess that this salad is an updated version of one of our first recipes. When we first started our blog, we weren’t sure what direction it was going in. After a month or two, we started clearly down the path of a low-carb food blog. We made this decision because that’s how we eat ourselves, so it just makes creating and tasting recipes much easier. Sometimes, we still have a Paleo dish, but if we do, it is always a low-carb recipe. This summer, I have been trying to update some of our earlier recipes and take photos in the same style that we have developed. 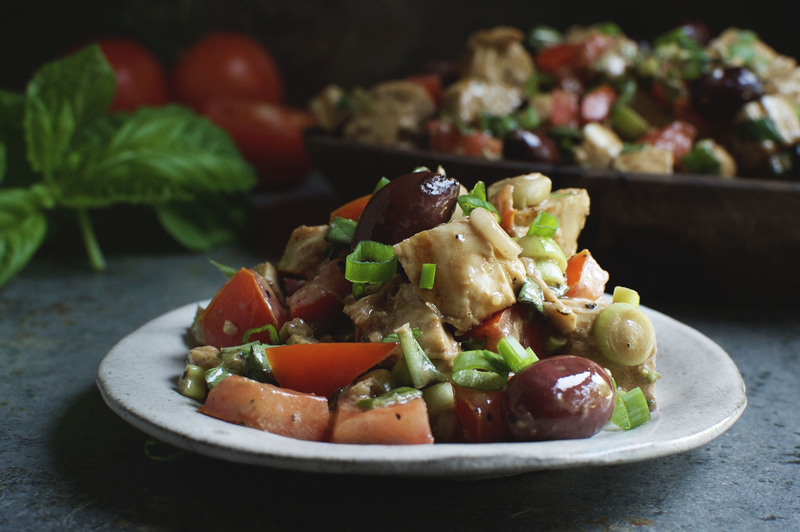 Our Mediterranean Chicken Salad recipe was one of the top on our list. As I started working through the recipe, however, I realized that the recipe wasn’t as low in carbs as I would like it to be. The old recipe contains sun-dried tomatoes, which I love, but are a little too high in carbs due to the concentrated sugars. I decided to use fresh tomatoes instead. In the end, I made so many changes in the recipe that I decided to release it as a new recipe. I did this because I didn’t want to remove a recipe that someone might search for again, only to find a new recipe in its place. So, the old recipe still stands and still could use a face lift, but this recipe will be a better fit for most of my followers. One thing I added to the recipe was a segment on how to prepare the chicken. The previous recipe simply called for already cooked chicken. For the new recipe, I simply rub the chicken with a bit of olive oil, garlic, salt, and pepper. After seasoning the chicken, I grill it to perfection. I love the garlic notes with this preparation and feel like the salad is richer with layers of garlic flavor. If you have leftover chicken, you can skip this step and use the cooked chicken you already have in the salad. I made very few changes to the dressing for the salad. The base of the dressing is olive oil and balsamic vinegar with a touch of garlic. It contains just enough mayonnaise to add a bit of creaminess and just enough sweetener to balance the acid in the vinegar. 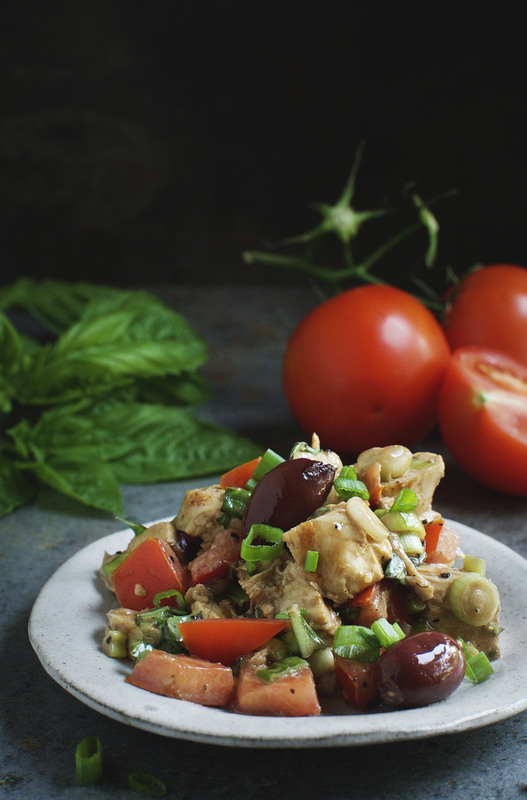 This dressing works well with the chicken, basil, tomatoes, black olives, and green onions. 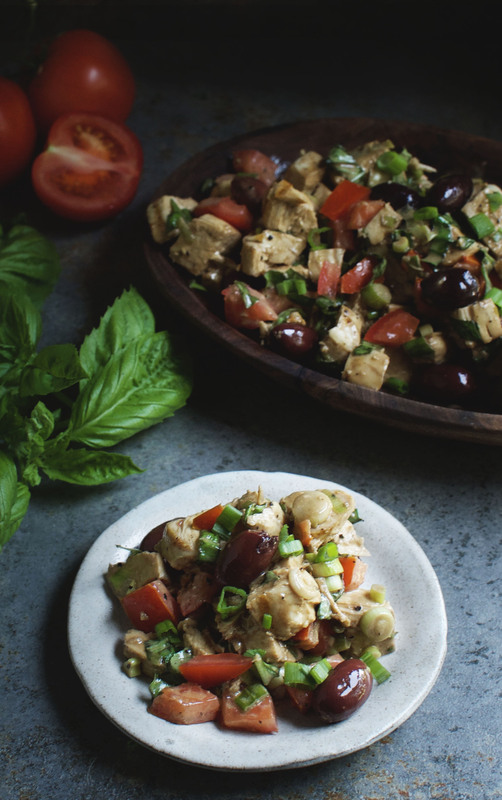 This chicken salad makes a delicious summer meal. Serve it for lunch or an easy dinner. It’s also easy to pack up to take to work or on an outdoor adventure. Other packable salads you may enjoy include this Nut and Berry Chicken Salad and this Broccoli Salad. Enjoy! Preheat grill on high. In a medium bowl, whisk together the olive oil and the garlic. Add chicken breasts and rub the olive oil mixture into the meat using your hands, coating all sides of the breasts. Sprinkle both sides of the chicken with salt and pepper. Place chicken on the preheated grill. Turn heat to low and close the lid to the grill. Allow to cook for 5-7 minutes, or until the first side of the chicken is slightly brown. Using tongs, turn the chicken breasts. Cook for an additional 5-8 minutes or until chicken is completely cooked through. Remove chicken from grill and set aside. While chicken is cooling, prepare the dressing. In a medium bowl, whisk together the olive oil and mayonnaise. Stream in the vinegar while vigorously whisking. Whisk in garlic and sweetener. Cut grilled chicken into 1 inch cubes. Add chicken cubes, green onions, tomatoes, olives, and basil to the dressing. Toss to coat. Taste and adjust seasoning if necessary. Cover and refrigerate until it's time to serve. I’ve been going through a face-lift phase with my older recipes too — but I think it’s wise that you left the older recipe on the site. I personally LOVE sun dried tomatoes, so carbs or no, I’m in. This does look like the perfect salad to start off the New Year on the right path, though. 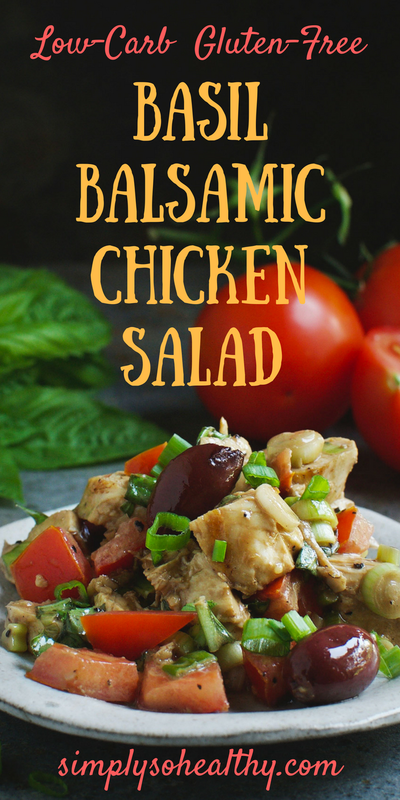 I love a good chicken salad and this sounds delicious with all the Mediterranean flavours! Totally craving this delicious salad now. Thank you for sharing this great low carb, healthy dinner option. I love how easy and tasty this dish is. My family loves balsamic therefore I’m sure it’s going to be a hit! Just recently started my low carb diet without any professional consultation, this looks just the right thing to add to my routine. Cheers to your mother-daughter duo.